The game will continue to play behind the scenes and any bets you have placed will stand. If you 'continue' you can still return to the game by selecting the game tab above. 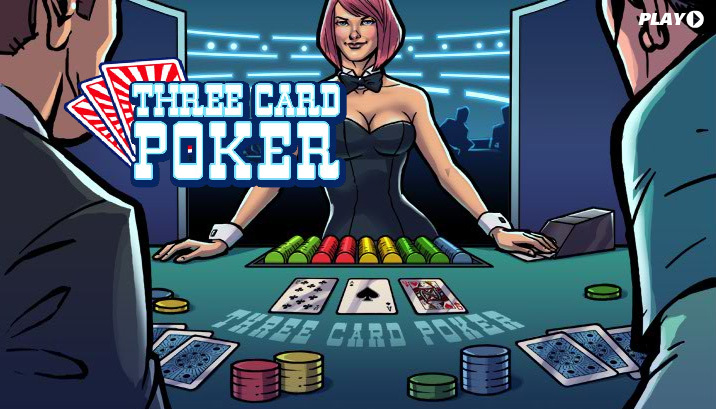 Three Card Poker is a very simple game with potentially two betting opportunities per hand. The object of the game is to beat the dealer with the best hand possible from one draw of three cards. As there are only three cards dealt, the hand values in this game differ slightly from normal poker. A straight beats a flush in 3 card poker, and the best possible hand is three 3's, also known as Prial. As with all our games you can back yourself to win or back yourself to lose. The game is played with a single deck and as it says above the object of the game is to beat the dealer in a draw of three cards. The game starts with you, the player, being offered the chance to place a blind bet before any cards are dealt – the spread price at this stage will always be 55-58. The option to skip this bet is also available. Three cards are then dealt face up to the player and a new spread price is generated - based on the strength of your hand. You then have another opportunity to skip or place a bet – after that the dealer’s three cards are dealt and the result revealed. Points are awarded for a win/tie plus the value of the hand. You currently don't have any favourites saved. To add a game, simply select one via the Menu and click '+' to add that game to your favourites. Sporting Index, the world leaders in online sports spread betting, offer an unparalleled spread betting service. With thousands of markets updated daily across a wide range of sports including golf betting, football betting, cricket betting, rugby betting & horse racing betting, you will always find something to bet on with Sporting Index. We also host unique spread betting virtual games which are available to play 24/7. Opening an account is quick & easy, and don't forget our Training Centre will help explain sports spread betting and give you extra confidence to spread bet. Join today and experience the ultimate thrill that only a sports spread bet can provide.